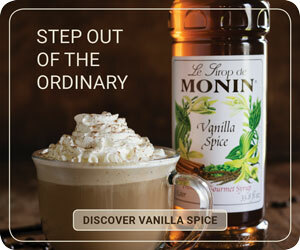 Combining alcohol and coffee in one delicious drink is an age-old pastime. Over the last few years, the combination has become more and more popular. Today, baristas and bartenders everywhere are playing with the potent pairing. The newest trend for mixing coffee and alcohol is barrel aging—putting fresh, green coffee in barrels previously used to make whiskey, gin, rum, wine, and other varieties of liquor. Barrel-aged coffee beans can be brewed hot or cold and sipped as is. They can also be blended into fresh new cocktails, exploring new depths of distilled flavors. 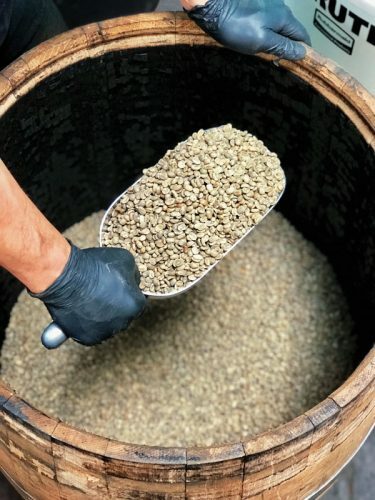 Adding barrel-aged coffee to a roastery’s lineup not only increases customer interest, it also gives roasters a creative challenge. Which coffee will do best in the barrel? How long should the coffee age in the barrel? Where is the balance between barrel influence and roasting process? 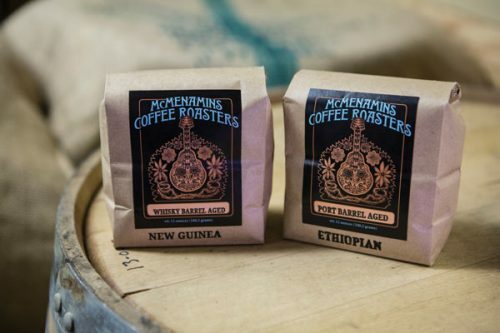 Coffee roasters have started barrel-aged programs out of curiosity or convenience. For others, it is a strategic collaboration with a distillery. 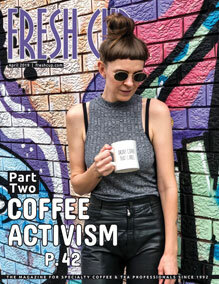 Inspired by barrel-aged beers, Modern Times founder Jacob McKean and original director of coffee Amy Krone began to experiment with barrel-aged coffees. 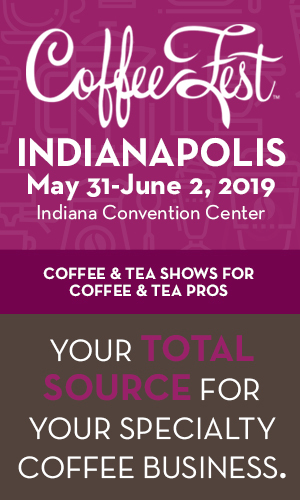 Since developing their coffee roasting program in 2015, they have found that barrel aging coffee develops uniquely interesting and enjoyable flavors. 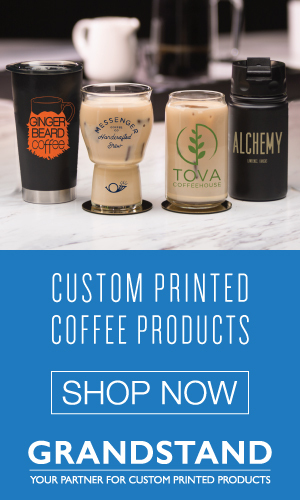 Adding a unique product such as barrel-aged coffees to café menus encourages customers to veer a little away from their usual order, increases engagement with your brand, and gives your baristas something interesting to sell—or upsell. When Pacific Northwest-based Caffè Umbria started their barrel-aged program as an experiment last August, the roasters had no idea if it would sell, or if it would even do well. They started with some end runs of their single-origin coffees and aged them for a month and a half in a tiny 10-gallon barrel. “The flavors were exceptionally pronounced, almost overwhelming,” says Pete Maskiell, Umbria’s main roaster and production manager. 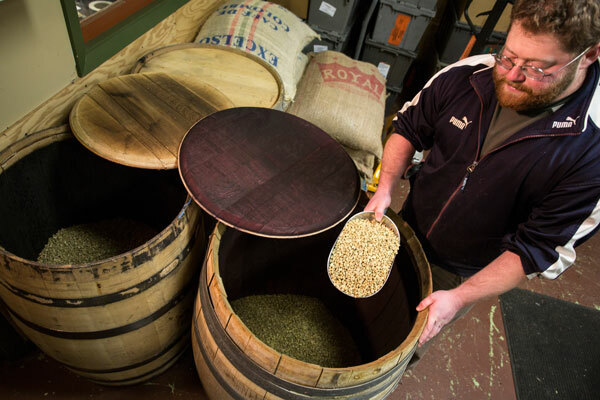 It took some trial and error, but their first 100-pound batch of coffee aged in a whiskey barrel was a sales success. Novelty is a big selling point, especially this early in the trend. Customers may have heard of, and even stood in line for, barrel-aged beers, but a coffee that has been aged in whiskey or rum barrels is still a new idea, and for many customers, that’s enough to get them to try it. Barrels can be expensive—$150–$300 on average—and their quality is hard to control. The cost of a barrel may seem a bit expensive, but it takes about a week on average to make one by hand by a skilled cooper. After the barrel is constructed, it is charred, then sent to a distillery or winery. After a barrel is used to impart its flavors and aromatic compounds—those dreamy vanilla or caramel notes—on an alcohol, the spirit maker usually discards it in favor of a fresh barrel before making the next batch of hooch. But for a brewery or a coffee roastery, these barrels are full of spirited goodness and are a hot commodity. How do roasters get their hands on booze-soaked barrels? 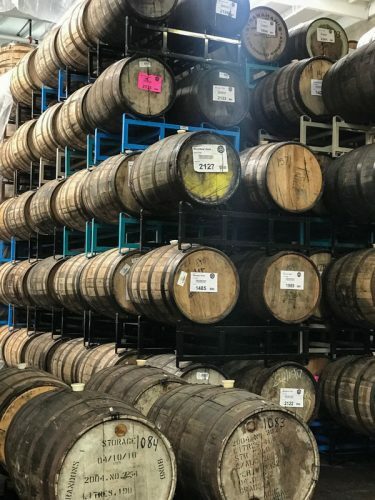 In the case of Portland, Oregon-based McMenamin’s, they have their own in-house distillery, which makes for an endless supply of fresh barrels. But for other coffee companies, strategic partnerships are the most common way they get into the barrel business. Late last year, Root & Branch teamed up with Bushmills Irish Whiskey. The two companies worked together to find the right coffee to age in the perfect barrel, in pursuit of the best Irish Coffee. 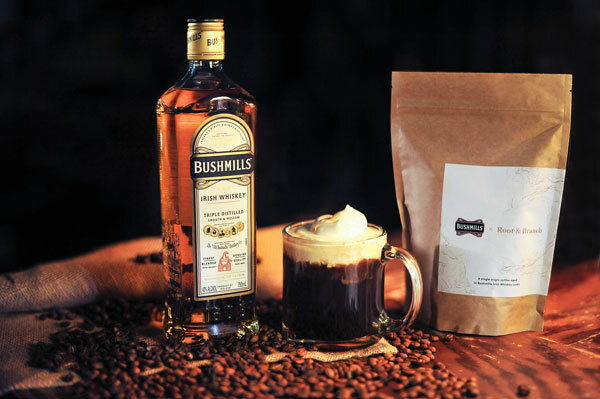 Bushmills gave the Belfast-based roaster special access to its distillery to see how the two might marry coffee and an iconic whiskey. With the efforts of Natasha David of New York City’s Nitecap cocktail bar, they developed a recipe for a warming cocktail sure to get your customers in the St. Patrick’s Day spirit. Add all ingredients in a warmed mug and mix well. Top with a dollop of vanilla-scented whipped cream. Garnish with freshly grated orange zest. In a blender, combine sugar and water, and blend until sugar is dissolved. Add extract and blend until incorporated.